Originally, I had considered camping on the beach at the end of the Homer Spit on Saturday night but it was a windy, chilly, wet day and well, I decided I would head toward Seward. 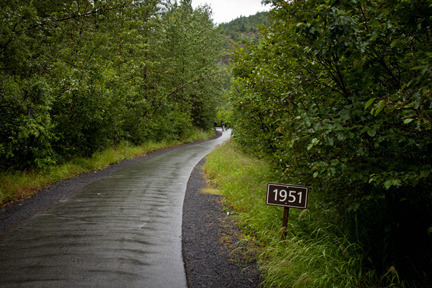 Ron and Marilyn had graciously offered me a place at their home but I headed toward Seward. I spent the night about 20 outside Seward beside a river and the highway into town. I had company of another camper though we never talked. I was up and moving about 6am. I headed into town and grabbed a quick breakfast and camped at the Safeway/Starbuck’s checking email and working on a blog posting. I got these bird pictures in Seward. 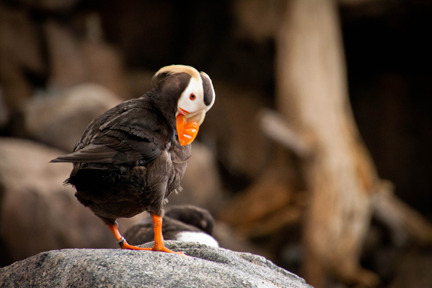 This is a Horned Puffin. I had hoped to go to a Puffin rookery when I was in Sitka but the captain wouldn’t take the boat out there unless conditions were perfect. He didn’t want a boatload of seasick customers. I couldn’t agree more! 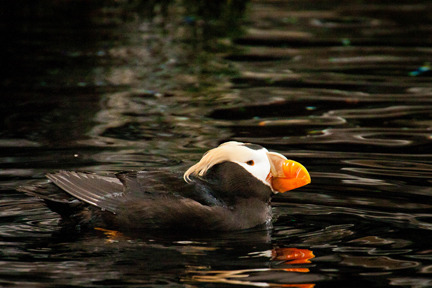 This is a Tufted Puffin. Notice the yellowish tufts behind the eye. 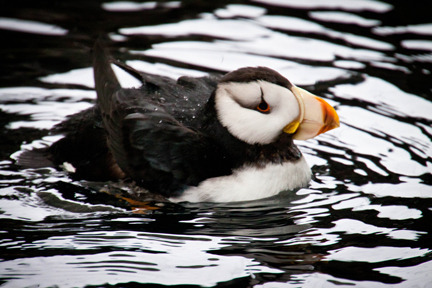 Otherwise, these puffins are identical. 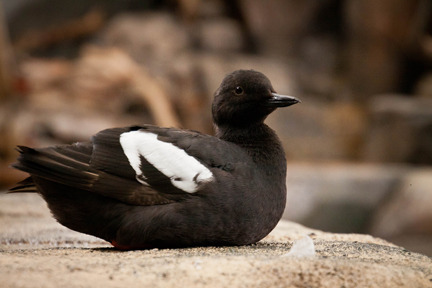 This is a Pigeon Guillemot. 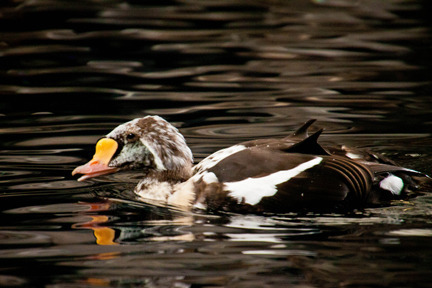 I shot a number of these while on the Tracy Arm cruise in Juneau but couldn’t get this close there. 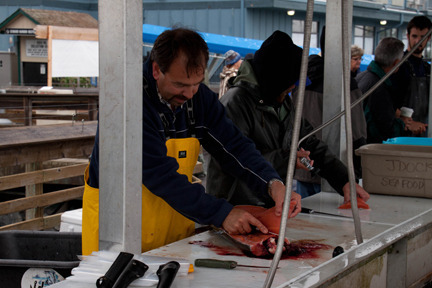 Seward, like Homer, is a big fishing location. 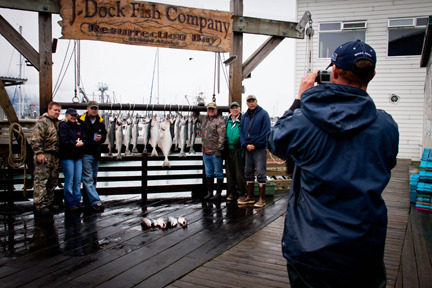 Here are a group of guys with their catch of Silver salmon and one halibut. From here it goes to the dock where these guys get their fish cleaned. 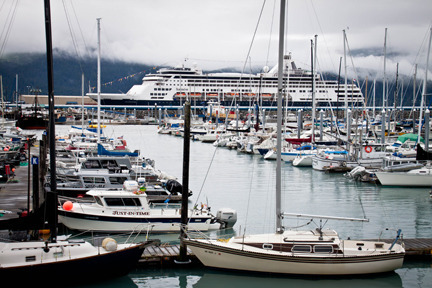 Seward is also the ending/beginning of many Alaskan cruises. People are put on a bus to Anchorage for the trip home or come in on a bus and start their cruise. I also went to Exit Glacier about 9 miles outside of Seward. I took a Ranger guided tour. The young guide explained that along the trail were these small signs. The 1951 indicates that this were the glacier ended in 1951. 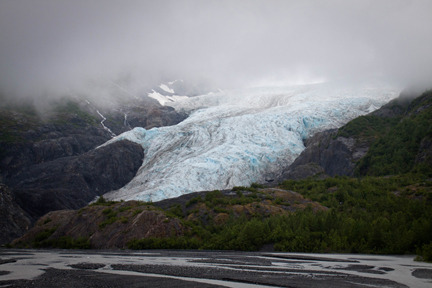 Sixty years ago, the glacier extended this far down the mountain. I’m not sure of the distance but I’d guess it to be less than a mile. I’ve been in Anchorage for two days. 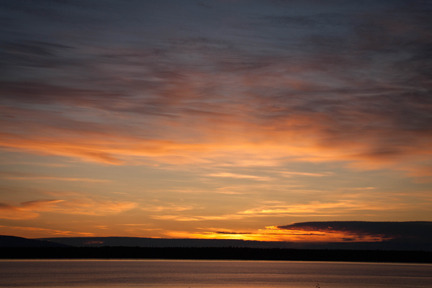 Last night I went to the foot of downtown to the end of Turnagain Arm Sound to shoot a sunset. This was shot at 11:10 pm. I hit my camping spot about midnight and there was still a light sky. I slept in until 7am this morning before sending my first blog this morning then I headed out of town around the Turnagain Arm. I walked a boardwalk looking for birds in Potters Marsh. No luck. 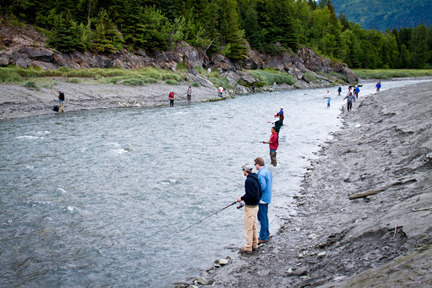 Then came upon these fishermen/women along Bird Creek eight or nine miles out of Anchorage. I think that brings me uptodate with my travels. Obviously, I’ve got hundreds of pictures that haven’t made it to the blog. Actually, I’ve uploaded close to 1300. I’ve also deleted a hundred or so that never got out of the camera. Tomorrow morning I leave for Brooks Lodge at Brooks Camp in the Katmai National Park. It’s a couple of hundred miles southwest of Anchorage. It’s actually a little southwest of Homer and north of Kodiak Island. I fly from Anchorage on PenAir to King Salmon then change to a bush plane to Brooks Camp. I’m taking my computer to upload pictures to but I doubt if I have wi-fi there. Therefore, you probably won’t get another blog until Friday. Ok….you can go back to work now except for my friends in Grand Island, NY . I don’t think any of them work….